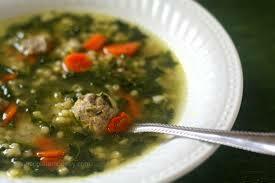 This soup was a hit at last night’s Purim celebration. The addition, that I think was brilliant, that my mother added was some cooked shredded chicken. She also shredded the carrots, rather than diced them. You can leave it out the chicken (meat and stock) and use vegetable stock instead if you wish to make this a non-meat dish. This soup will serve 6-8 people. * Click here to see how to clean parsley. Heat the vegetable oil in a large pot over medium heat and sauté the onion, carrots, saffron and turmeric until the onion becomes translucent. Add the pearl barley to the pot and stir for one minute. Stir in the hot chicken stock, shredded chicken, lime juice, tomato paste, salt, and pepper. Bring the mixture to a boil, reduce heat to low, and simmer for 1 to 1 ½ hours, until the soup has thickened and the carrots and barley are tender. 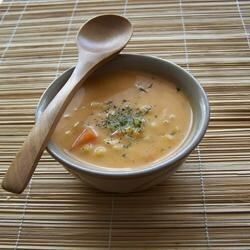 If the soup is too thick, add hot water, one tablespoon at a time. Place the sour cream in a small bowl. 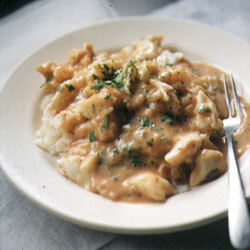 Slowly pour ½ cup of hot soup mixture into sour cream, whisking constantly. Gradually add the sour cream mixture into the soup pot, whisking constantly. Stir in the fresh parsley. Serve with fresh lime wedges. This is an easy, authentic chicken dish that gets its creaminess from coconut milk, rather than cream or yogourt, so it’s dairy free! This recipe will make enough for 6. I suggest serving it with basmati rice or na’an. Heat the vegetable oil in a large skillet over medium heat. Add cumin seeds, and fry for a few minutes until they become fragrant and begin to pop. 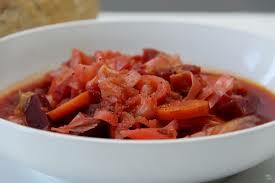 Stir in chopped onion, and cook until the onion has softened and turned translucent, about 3 to 4 minutes. In a small bowl, mix together the tomato paste and water, and pour into skillet. Add the chicken to the skillet and cook until it has firmed and turned white, about 5-7 minutes. Add coconut milk, brown sugar, chili paste, cayenne pepper, turmeric, salt, and pepper. Bring mixture to a simmer, then reduce heat to medium-low, cover, and continue to simmer until the chicken is tender and no longer pink in the centre, about 15 minutes. Sprinkle with chopped cilantro before serving. * Click here to see how to properly clean fresh cilantro. Trim the veal/beef shanks, and season them with salt and pepper, then dredge through the flour, shaking off any excess flour. Heat oil in a large pot and sear the meat to a deep brown colour, about 3-4 minutes on each side. Due to the amount of meat you are browning, you may have to do this in batches. Remove the meat and keep separate. Put the onions in the pot and stir, until golden brown. You can add a little more oil if needed to keep the onions from burning, but you do not want a lot of oil in the pot. Add carrots, celery and garlic, and sauté stirring frequently, cooking for 5-6 minutes. Add the tomato paste and cook until it turns a deeper colour and gives off a sweeter aroma, about 1 minute. Deglaze the pan with wine, and reduce liquid by half. At this point, most likely your pot will not be large enough to fit all of the meat and vegetable mixture/sauce, so I often transfer everything to a large casserole dish or aluminum pan. Pouring about half of the vegetable mixture down first, then the meat in a single layer, then topping with the rest of the vegetable mixture. At this point you want to add enough stock to cover the meat by ⅔. Add the sprigs of herbs and cover the dish and put in a 350 degree oven, letting it braise for 2 – 2 ½ hours, until tender. 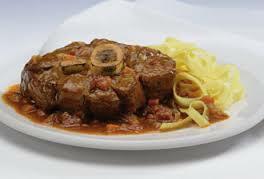 Classically, at this point, you would remove the herbs and the meat from the pan, and then strain the sauce, only leaving the liquid behind to be thickened with some cornstarch and served with the meat. In my household, vegetables are NEVER put aside! We do not strain the liquid, but serve it as an accompaniment to the meat, often on top of wide egg noodles. Should you wish the actual liquid of the sauce to be thicker, you can separate some and thicken it with cornstarch to serve as an almost gravy. Any way you serve it, you must enjoy! * to learn how to clean rosemary and thyme properly, click here. Prepare cabbage by either boiling or freezing method. Remove and check leaves. To see the process on how to freeze or boil the cabbage, click here. To learn about checking the leaves for insects, click here. Combine all ingredients for meat mixture in a bowl and mix well. Take a single leaf of cabbage, and place a couple of tablespoons of filling at the base of the leaf. Roll the leaf up, folding in the sides as you roll. Rolls should be able to remain sealed without a toothpick. 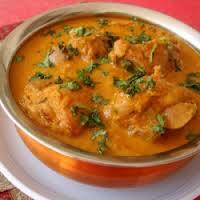 To make the sauce, heat oil in a large pot, stir in flour, and cook until brown. This is called making a Roux, and it will act as a thickener for the sauce. Add rest of ingredients in order listed. 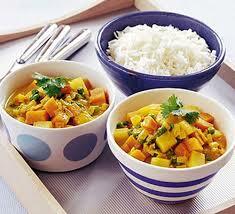 Bring to boil and simmer for 5 minutes.You can add more lemon juice, sugar or pepper, according to taste. In a large 8-quart stock pot, place a few of the extra/small or torn leaves that you have left over from making the rolls, and line the bottom of the pot. 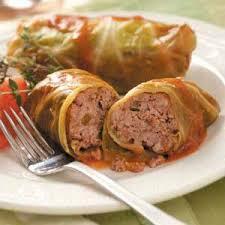 Add about and inch or so of sauce, and lay your cabbage rolls carefully, seam side down, in the sauce one by one. The rolls may be piled in layers if necessary. Cover the rolls with the remainder of the sauce, and any cabbage you have left over can be used to cover the rolls. If you have extra filling, you can either freeze it for next time, or make small meatballs out of it, and place it in the sauce as well. Cook on low flame for 2 hours, adding more water if necessary. The rolls are done when the meat is cooked through and the rice is tender. This recipe will serve 8 to 10 people, depending on how much your guests like their meat! The recipe calls for fresh thyme and parsley. I’ve noted the equivalent in the ingredient list for dried thyme, but for the parsley, it is slightly different. Because you are using half the parsley on the vegetables and half in the gravy, you would need the equivalent of 2 tablespoons dried on the vegetables and 2 tablespoons dried in the gravy. If you wish to use fresh herbs, please refer to the vegetable checking page to learn how to properly clean them. Sprinkle the roast all over with 2 ½ teaspoons salt and 1 ½ teaspoons pepper. Coat in flour and shake off any excess. Heat 2 tablespoons of the oil in a large non-stick skillet over medium-high heat. Add the roast to the skillet and cook until golden brown on all sides, about 8 minutes, turning as needed. 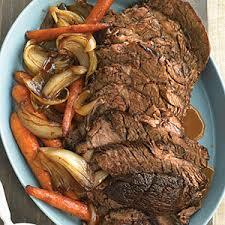 Transfer the roast to the insert of a 6-quart slow cooker, along with the carrots, celery, onions and garlic. Add the remaining 1 tablespoon oil to the skillet over medium heat. Add the tomato paste and stir until the oil begins to turn brick-red, about 1 minute. Add the flour and wine and whisk until thick (it’s OK if there are some lumps). Add the beef broth, bay leaves, thyme, allspice, ½ teaspoon salt and a few grinds of pepper and bring to a simmer, whisking, until the gravy is smooth and thickens slightly, about 4 minutes. Pour the gravy into the slow cooker. Cover and cook on low for 8 hours. The roast and vegetables should be tender. Remove the roast and let rest for a few minutes. Discard the thyme stems and strain the vegetables, reserving the gravy. Toss the vegetables with half the parsley and season with salt and pepper. Stir the remaining parsley into the gravy and season with salt and pepper. Slice the roast against the grain. Serve the meat and vegetables on a platter, moistening them with some of the gravy; serve the remaining gravy on the side. If you want to make this ahead of time, follow all the same steps, browning the meat and creating the gravy, but allow them to cool. Slice up your vegetables, and add everything (minus the parsley) to a large gallon sized freezer bag. When you wish to actually cook your roast, let it defrost in your fridge first, then add it the crock pot and follow the remainder of the above instructions. It may take a while for the roast to defrost, even overnight. I suggest having a drip pan underneath it in the fridge so that you don’t have to worry about any errant juices. Add a little Indian flair to your dinner table with this easy curry chicken. This recipe serves 8. In the bottom of the slow cooker, whisk together coconut milk, chicken stock, tomato paste, garlic, ginger and all of your spices. If you are using the chili, lemongrass and kaffir leaves, add them now too. Add chicken breasts, onion, chickpeas, both kinds of potatoes and the zucchini. Using tongs, gently toss ingredients together to ensure everything is evenly coated. Cook on Low for 8 hours or High for 4 hours. Stir in peas and lemon juice 5 minutes before serving. Serve over rice and with plenty of fresh cilantro. In order to make this ahead of time, simply whisk together coconut milk, chicken stock, tomato paste, garlic, ginger and all of your spices in a small bowl. If you are using the chili, lemongrass and kaffir leaves, add them now too. In a large gallon sized freezer bag, place the chicken and vegetables, except the peas, and pour your liquid spice mixture over everything in the bag. Seal the bag, removing as much air as possible. Rub the chicken through the bag, rubbing the sauce over and into chicken. Store the bag flat in the freezer until frozen through, then you can stand it up until you’re ready to use it. When it comes to the day you decide to serve the chicken, cook on low for 8 hours, and then follow the rest of the steps for preparing the dish the same as above.